"The gnomes of Fairyland are particularly fond of this golden beer. 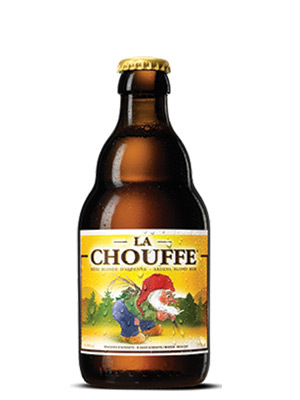 LA CHOUFFE, with its slight hoppy taste, combining notes of fresh coriander and fruity tones, is the drink which gives them their zest for life. At least, that's what these imps say when they are thirsty. Their secret used to be jealously guarded from one generation to the next until the day they shared the recipe with humans to seal their friendship. Of all the legends from the wonderful region of the Belgian Ardennes, the tale of LA CHOUFFE is the one which most merits re-telling. "